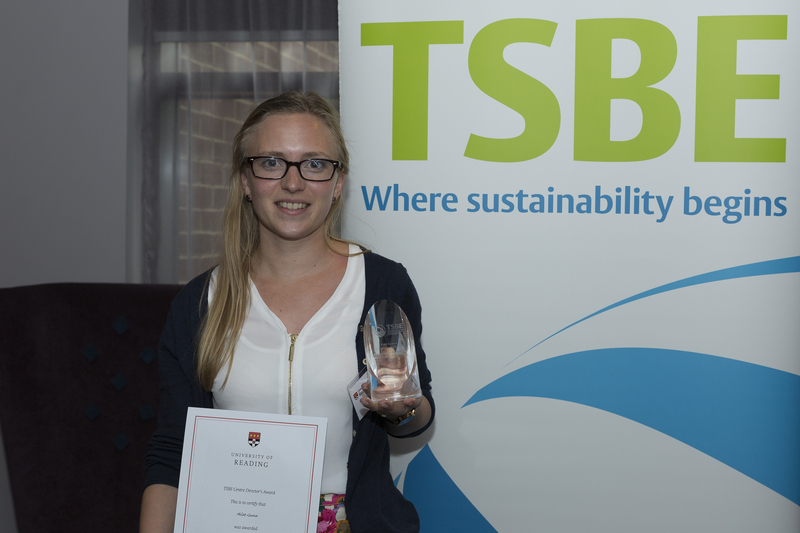 The University of Reading Students Union (RUSU) have awarded Jenny Berger, the manager of the Technologies for Sustainable Built Environment Research Centre (TSBE), the Support Staff Excellence Award at this year’s RUSU Partnership in Teaching & Learning Showcase. The RUSU Excellence Awards recognise University of Reading staff who display excellent and innovative teaching practice. The students award the staff who they believe have gone above and beyond expectations, tirelessly working to improve the delivery of students teaching and learning experience. 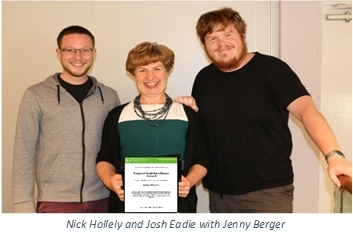 Jenny has been given this award in recognition of her outstanding work, supporting the Engineering Doctorate students (EngD) in the University. TSBE Centre Research and Impact Fellow, Dr Sam Mudie, has published a further journal article, the 4th from the successful EngD Project “Energy Use and Reduction in UK Commercial Kitchens”. The most recent article, “Low energy catering strategy: insights from a novel carbon-energy calculator” sheds light on a staggering £1.27 BILLON pounds worth of energy wastage within the UK commercial catering sector. The paper explored the energy consumption of commercial food preparation activities within a leading operator of public houses and restaurants. Dr Mudie spent two years developing the “Catering Energy, Carbon and Cost Calculator” with the support of the research sponsor and other industry organisations including the UK Carbon Trust, Catering Equipment Suppliers Association and the British Hospitality Institute. After in depth analysis of the large range of menu items and ingredients, cooking appliances and techniques available, the research found average energy savings of £10,200 per year per site on gas and electricity by replacing 3 appliances and reducing the freezing demand. By removing the gas powered chargrill, electric deep fat fryers and the microwave combi ovens and replacing them with two high efficiency combi steam jet impingement ovens, annual energy consumption was reduced by 58%, equating to a 55,000 kgs of CO2 saving per site. The initial increase in capital cost is paid back in a little as 3 months. A new approach in the delivery of a menu can save as much as £2m for the case study chain and £1.27 billion pounds for the commercial catering sector. The study did find cooking times to be increased, from 7.2 minutes to 18.6 however the low energy catering template could still deliver the required throughput and menu diversity for the daily, weekly and annual food service operation. 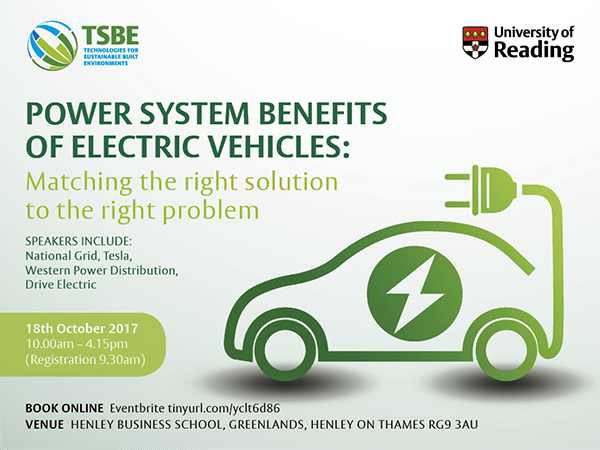 TSBE hosted an electric vehicle industry forum at Henley Business School. 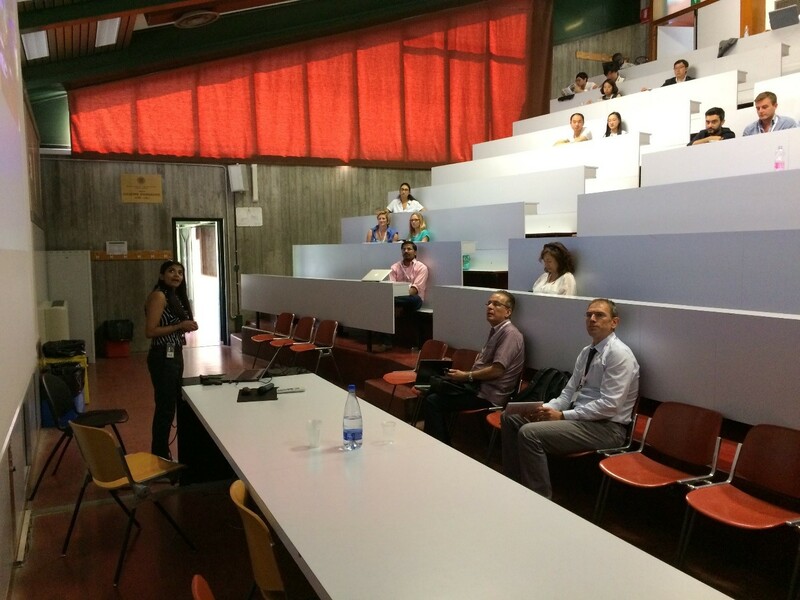 This exciting conference, “Power System Benefits of Electric Vehicles”, brought together experts on the integration of electric vehicles within power systems, and provided a forum for networking and knowledge sharing to help industry take advantage of the opportunities that EVs will bring. Speakers included National Grid, Nissan, Western Power Distribution, Drive Electric, Sainsbury’s, Ofgem, OVO Energy, Cenex, Costain and Un iversity of Reading. 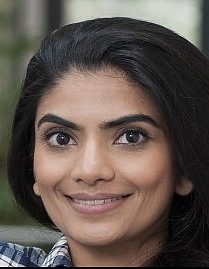 The impact of this vibrant oversubscribed event was commented on: “A thoroughly engaging update of the current state of the electric vehicle & power system industry”. A University of Reading industry forum “Matching the right solution to the right problem” for electric vehicles & power systems. 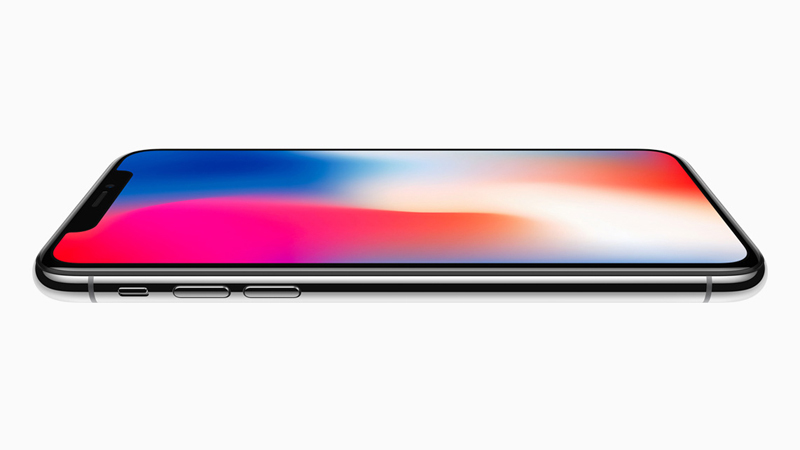 Professor Ben Potter of the TSBE (Technologies for Sustainable Built Environments) Centre, University of Reading was recently interviewed for the above article; Read it here: I phones and electric vehicles. The TSBE Centre are currently working with and Anthony Simpson on a project researching ‘Real world considerations for the grid integration of electric vehicles’. Against the backdrop of a rapidly changing power system, there is both excitement and concern about the implications of charging a growing fleet of Electric Vehicles (EVs). Though still a small fraction of the overall vehicle market, EV uptake is seeing dramatic growth, with numerous factors coming together that could accelerate this trend. Air quality concerns, in particular, are coinciding with falling battery costs and new vehicle launches, leading to ever more ambitious growth prophecies and policy targets. Such moves are exemplified by France’s recently announced target to end sales of petrol and diesel vehicles by 2040. At the same time, concerns are growing about the potential impact that uncontrolled EV charging could have on the safe and secure operation of our local and national power networks. The University of Reading have been working with energy companies to understand and plan for the energy system challenges brought by increasing adoption of variable renewable generation. One strand of this work lies with mapping practical, real world flexibility solutions to emergent challenges. The role for controlled EV charging lies at the forefront of this research. The University are now seeking to bring together energy industry experience in this area with findings from the latest research into wind and solar energy behaviour, as well as to promote awareness of the importance of choosing when vehicles charge for maximising carbon benefits. The event will bring together experts from across the energy and automotive industries to explore how controlled charging of electric vehicles can best meet the growing challenges of variability in our power system. Steered by current project partners, the day will involve stakeholders from across the whole energy supply chain, from the automotive sector, from enabling companies and from academia. Participants will hear from the latest research on managing power system variability alongside learning from real world implementation of controlled charging solutions. The event is funded through the University of Reading’s Impact Support Program and supported by Drive Electric, Costain, Energy UK and the Thames Valley Chamber of Commerce. Insight will be supplemented by the experience of a diverse range of industry participants including scene setting presentations from Tesla and National Grid as well as early findings from Western Power Distribution’s Electric Nation project. Today Dr Phil Coker from University of Reading was interviewed by Bill Buckley of BBC Radio Berkshire about government plans for electric vehicles by 2040. When asked about how the increased demand for electricity will be met, Dr Coker explained that research was being undertaken into shifting demand of charging vehicles from peak demand times to other times in the day or night when the existing electricity network has excess capacity that could be utilised for electric vehicles. An overview of our research can be seen by watching our short video http://www.closeupresearch.com/tsbecentre/ . 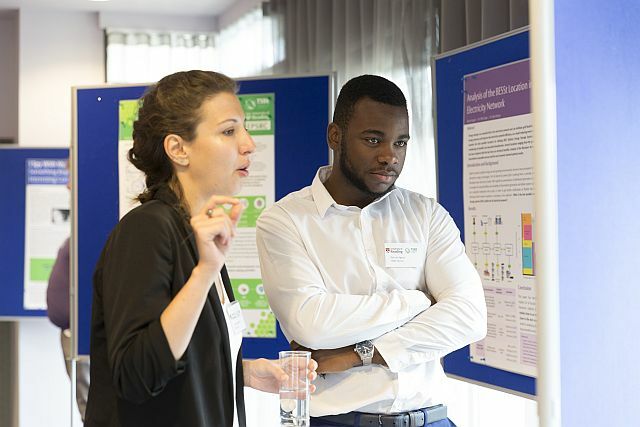 The conference buzzed with the TSBE Centre’s sustainability research developments, with presentations ranging from’ virtually manipulating landscapes to assess ecological impacts from large infrastructure’ (Katie McCausland & Costain) to ‘Energy storage in power distribution networks by Max Zangers’. The winner of the Research Engineer was Alice Gunn who is in her final year of research and presented her paper entitled ‘stakeholder perceptions of energy system models and their role in policy making’. Alice is sponsored by Scottish & Southern Electric. EngD students at the TSBE Centre had a unique opportunity to gain an insight into the diverse experiences of a Royal Marine and learn how military grade decision making techniques are applied to solve complex situations. Gareth Tennant is a serving Major in the Royal Marines Commandos and he specialises in intelligence, surveillance and reconnaissance techniques. Building on his experience in combat operations and involvement in development of management strategies for the military, Gareth is now working on delivering information exploitation techniques to the commercial sector to support decision making in the context of increased connectivity of systems and the rapidly growing availability of data. Turning data into intelligence. Photo by Dr Harrison. For the TSBE centre, Gareth presented on the different types of problems drawing on examples from his experience on combat operations, highlighting the existence of “black swan” problems – the unforeseen instances of problems with high impact. Using an analogy of climbing a mountain, he explained the difference between strategic direction and tactical application, where strategy is setting the goal of getting to the summit and tactics is the act of climbing. He then introduced us to practice of operational art, which is how the military ensure that tactical decisions have strategic results. 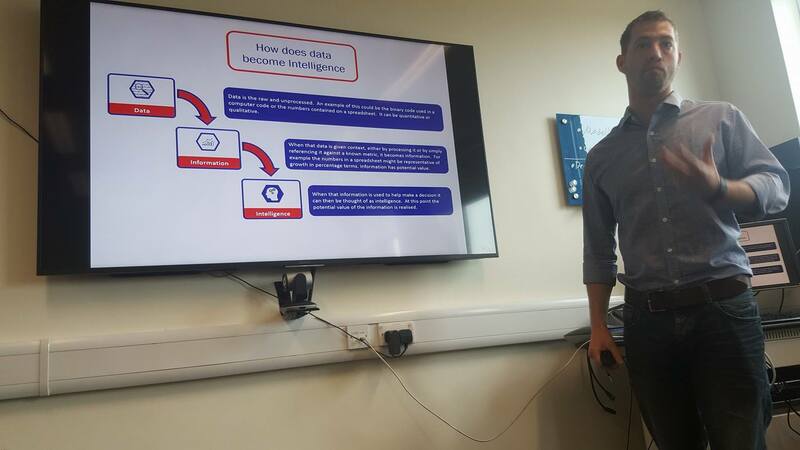 Gareth then presented to the TSBE Centre a framework of 7 factors designed to support decision making through information exploitation: from turning data into actionable intelligence, to developing strategy for making the decision, taking into the account the culture and heuristics within the problem, and ultimately the consequences of the decision. The TSBE centre is organising further joint activities to enhance the decision making skills of the EngD students and take advantage of the proven information exploitation techniques.